So, you have a potential site for a biogas plant, and as in most cases, as the promoter of a new facility, you will have at least some organic matter to use as the feedstock. Nevertheless, there is a decision to be made when the project plan identifies a need for additional feed material (known as the “substrate”). Anaerobic digestion plants can usually accept a wide variety of feed materials, but they may not be adaptable enough for all types of feed material, so this is important. The feed material choice will from the start of the detailed biogas plant design, determine the way in which the biogas process is designed. So, the thing you should know is that there is growing competition from biogas plant owners to compete for the best types of waste to “treat” and “dispose of” in their plants. If the promoter of a biogas plant facility chooses these, as the feed source, it is important that they know the following fact. That fact is that, what may now be considered to be a waste, and a waste stream for which the biogas plant company can charge a “disposal” fee, may eventually come to be seen as a saleable material and need paying for. Some wastes like food wastes are highly calorific (making them high gas-yielding and highly desirable for digestion), and may come without any need to comply with the Animal By-products Regulations (UK). But, before assuming that the wastes of this type will always be freely available and bring in a gate fee, the promoter should note that, this value may well quite soon be appreciated by the producer. When that happens the producer may start to charge a fee, and not the other way around! Once there is adequate anaerobic digestion capacity in any region it is common for a seller’s market to develop, and for the producer to start charging the AD Company for the honour of digesting their waste product! For this reason always probe deeper and find maybe less high gas-yielding feedstock wastes which are less than ideal as a biogas plant feed material, but at the same time such feed stocks can be much more secure as long-term economic digester feed sources. All biogas plant promoters should think very carefully about the design-life of their biogas plant. Many poor quality biogas plants are being built which will suffer long-term problems and will close a long while before better quality AD plants, built to a longer “design life”. This can make “cutting corners” very bad value. The majority of biogas plants are built to a budget as a necessity of funding, nevertheless, as the industry matures those buying biogas plants will have to stop buying the lowest priced tender and develop an in-depth understanding of value for money, and “lifetime maintenance” costs. It is ONLY by doing this and specifying the design life of biogas plants from the start, that better value can be obtained. An example is the use of cheap mild-steel plate based digester and ancillary tanks. A sensible design life for AD plants is 15 to 20 years, maybe longer. However, few if any tank suppliers will provide a warranty for the continued corrosion-free performance of glass coated steel tanks beyond 10 years. 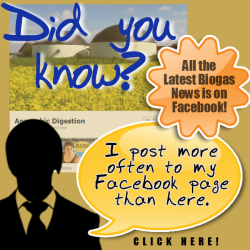 This is too short a design-life for anaerobic digestion plants. Biogas plant substrates need mixing. On-farm plants, as offered by the cheapest AD Plant contractors, are frequently not supplied with any mixing equipment. This is more often than not a mistake soon regretted, and will shorten the life of the plant in-between costly maintenance work. Novice designers of biogas plants can offer very low-cost AD plants, which work on-paper, but not successfully when constructed. Designing AD plant pipework is truly the domain of experienced pipe flow engineers only. To avoid problems later with pump and pipe blockages, needs a designer who understands every aspect of designing-out blockages, ranging from pump model selection to choice of pipe diameters, bends and specials. Often overlooked is the propensity for any biogas plant design which accepts waste material to become blocked-up due to the presence of grit which enters (wet AD) biogas digesters, and won’t come out until the whole tank is dug out with a Tomcat excavator, or similar! Always ensure that any AD plant designer has made adequate provision for removing any grit build up. This list of tips doesn’t cover all the problems that can occur, but these are at least some of those that keep occurring and that we thought that our readers would benefit from knowing about. For more information on our training course for those planning to design and build a commercial biogas plant, and to make that biogas plant profitable, and successful, we recommend that you visit our “9 Steps to Biogas Success” Training course here. Hi! 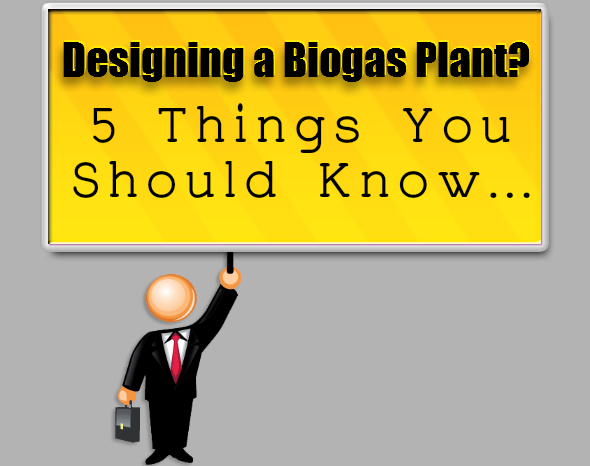 Very useful info you give for me to use to design my biogas plant. Hi I am trying to design my own biogas plan and stuck with the use of two separate tanks or putting tanks on each other . Which will be more sustainable design and how to introduce a stirrer ?